Because of this, many people are filtering and purifying their water or even buying expensive mineral water. 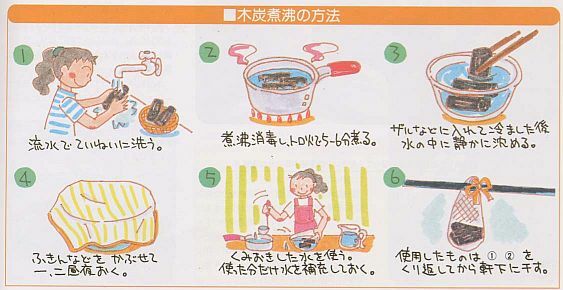 Now, using charcoal for safe tap water has come to public attention in Japan. Using charcoal can make safe water easily, tasty, and cost-effectively! It is important to use hard charcoal. Normal black charcoal breaks easily in the water. Raw charcoal is dirty and not suited for boiling. Wash them under running water. You can use a scrub brush to help in the process. Do not use any detergent! It will destroy the beneficial effects of the charcoal and will spoil the water. 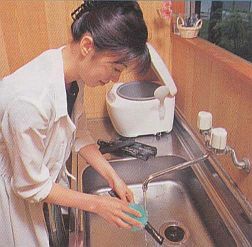 Sterilize it in boiling water. Use a large uncovered pot. Boil for about 10 minutes. Put the charcoal into a colander to squeeze out the water and let it cool down. Gently submerge the charcoal in a container poured with tap water or well water. Use about 100 grams of charcoal for every 1 liter of water. In order to prevent dust from entering, cover it with a dishcloth and let it sit for 1–2 days. It is recommended to use a container made of stainless steel, porcelain enamel, ceramic, or glass. Pour this water into a vessel and use it for cooking or put it in the refrigerator as a drinking water. This is your sterilized water! 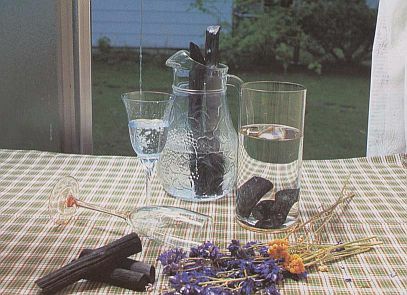 Refill the container containing the charcoal with water to make more purified water. You can repeat this process for one week. Clean the dirt off the charcoal once a week. The method is: boil, let it cool down, and dry it for one week. To use the charcoal again, simply start from number 1 method. It is best to prepare two sets of charcoal and rotate them weekly. In this way, the charcoal can be used for 6 months! But take note that the mineral amount of the charcoal will gradually deplete after 10 days of use. 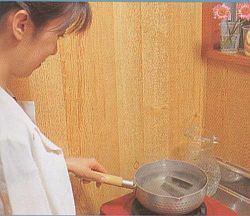 The purified water can be used for cooking, ice making, drinking water, tea, coffee, and alcoholic drinks. Ill-smelling chlorine and other unpleasant odors will be eliminated by the absorption power of the charcoal. Microorganisms living in the many pores of the charcoal break down unhealthy organic matters in the tap water. Ash in the charcoal (minerals) contains nutrients such as magnesium, manganese, calcium, and iron which dissolve easily in the water. The minerals are essential for your healthy life. They help make strong bones and teeth, and play an important role in blood, muscles, and nerves. You can recognize the minerals of the charcoal purified water by its soft and mellow taste. Since the charcoal is a byproduct of trees, it does not contain any toxic substances like mercury and chromium. After the charcoal has been used for 3–6 months, break it into pieces and bury it in a flowerbed or kitchen garden, it will improve your soil. The charcoal can also be used in oils for frying, and when retaining a vegetable's freshness. Banana vinegar used for health and beauty is now popular in Japan. The banana vinegar will keep you healthy and beautiful including your skin. The vinegar is not applied externally. Use it for cooking or dressing purposes. How to make banana vinegar? It's so simple. Prepare a good quality dressing or cooking vinegar and any ripe (matured) banana. Mash the banana and keep it together in the bottle for about two days or more. Now, you have a good taste and healthy vinegar on your dining table.